Age: At first glance this appears to be an adult, or an adult-type, large white-headed gull. The light gray tips to the median coverts are reason enough to suspect this is a sub-adult bird. Identification: This month's quiz bird is dark-backed with rich yellow legs. There aren't many species that meet this criteria in North America. Lesser Black-backed Gull, California Gull and Yellow-footed Gull should all be considered. I will dismiss California Gull on the count of it being a noticeably paler species than what is seen here. On the palest end, California Gull scores a 5 on the Kodak Gray Scale, and a 7.5 on the darkest end. The palest Lesser Black-backed Gull (subspecies graellsii) scores a 9 on the Kodak Gray Scale, and a 13 on the darkest end (nominate fuscus - unrecorded in North America). Yellow-footed Gull (monotypic) ranges 9-10.5. We are left with Lesser Black-backed and Yellow-footed Gull. The bill on our bird is thick all throughout and shows a noticeable bulbous tip. This seems much better for the Mexican species. Zooming in we note a darkish iris and yellow orbital. Adult type, and even many sub-adult Lessers, show eyes that are considerably paler than this. Lesser Black-backed also sports a reddish orbital ring. Our quiz bird is indeed a Yellow-footed Gull photographed at the Salton Sea in Imperial County, California. September. Slaty-backed Gull (2nd cycle). Camrose-Llyodminister County, Alberta. 02 May 2018. Glaucous Gull (1st cycle). San Mateo County, California. 02 May 2018. Lesser Black-backed Gull (adult). Natrona County, Wyoming. 03 May 2018. Little Gull (adult). St. Louis County, Minnesota. 04 May 2018. 2 adults seen in the area on 12 May 2018. Iceland Gull (1st cycle). Harrison County, Mississippi. 08 May 2018. Herring Gull (1st cycle). Mohave County, Arizona. 09 May 2018. Great Black-backed Gull (1st cycle). Burleigh County, North Dakota. 12 May 2018. Iceland Gull (1st cycle). Cook County, Illinois. 12 May 2018. Black-headed Gull (adult). Aleutians West County, Alaska. 12 May 2018. Franklin's Gull (adult). Saint Paul Island, Alaska. 16 May 2018. Apparent 6th record for the island. Glaucous-winged Gull (adult). Fort Smith County, Northwest Territories. 18 May 2018. 2nd record for the Yellowknife area. Franklin's Gull (1st cycle). Transylvania County, Pennsylvania. 18 May 2018. Franklin's Gull (adult). Anchorage County, Alaska. 19 May 2018. Slaty-backed Gull (adult). Kodiak Island County, Alaska. 20 May 2018. Ross's Gull (adult). Kusilvak County, Alaska. 24 May 2018. Heermann's Gull (adult). Yuma County, Arizona. 25 May 2018. Laughing Gull (adult). St. Louis County, Minnesota. 26 May 2018. Common Gull (adult). Avalon Peninsula. Newfoundland. 26 May 2018. Found in a Ring-billed Gull colony. No evidence of nesting. 1. An apparent 1st cycle Laughing x Ring-billed Gull was photographed in by Janice Soos Farral in Lucas County, Ohio in early May. Photos here. 2. The dark-winged 1st cycle Ring-billed Gull photographed in Lansing, Michigan in early April 2018 was apparently spotted in Berrien County, Michigan on 09 May 2018. This individual may clarify the juvenile Ring-billed observed in Wisconsin Point a couple of years ago, suspected of being a Ring-billed x Lesser Black-backed Gull. Previous to this, solid dark wings as such have only been reported in small, hooded, gulls in North America. 3. Back in March of 2018, Pennsylvania Game Commission biologists fitted 9 adult Lesser Black-backed Gulls with satellite transmitters. 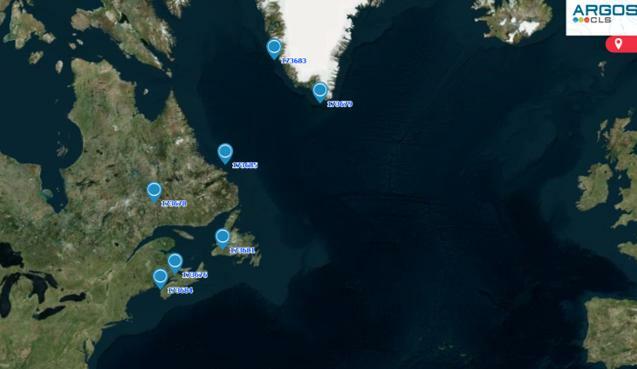 As of 21 May 2018, two individuals had made it to southwest Greenland, and 5 others were to the far northeast between the Bay of Fundy, Northern Quebec and Newfoundland and Labrador.